I read an article this morning, I think in the New Yorker. Although maybe the New York Times. New York was definitely involved. The writer used the word alas, which I realized is sort of a canary in my personal mineshaft. I tend to roll my eyes and make assumptions when I see someone alassing me. Because it's archaic and old-fashioned, a relic of Middle English, seized upon by Shakespeare and other Elizabethans, perfectly acceptable in Victorian usage, and then out the window, onto the heap where we put our ice boxes and those cranks that used to start cars. It was not a 20th-century word, according to me, and hasn't redeemed itself. It's just a word. It has a fine etymology, and I'd certainly use lassitude if I felt like it, written or spoken. But not alas, and when I see it I become judgmental. I take off points. I think the writer is trying to impress me, somehow, but really it's more of a goof. An amateur act. In my opinion. Although it was fun to watch my fellow bloggers, on the receiving end of my wisdom regarding this today, figuratively (and frantically, I imagined) scouring their memories and trying to cover their alasses. It's just a taste trigger, and honestly I never thought about it until today. It seemed funny, this little shorthand I use to determine whether I need to take someone seriously or not. It certainly wasn't a reference to any of those bloggers or anyone else I read on a regular basis. Maybe they've used the word, maybe not. With them, I've already moved on and become part of their audience. My opinions have been formed and I still read, so we're all good here. And this is really about Facebook. I decided to collect these graphics, in an (probably futile) attempt to tame my knee jerking. 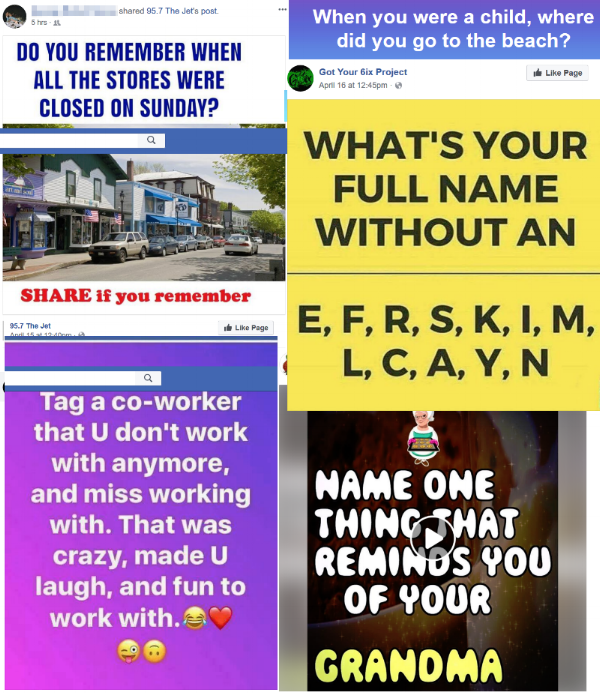 These are posts my FB connections interacted with at some point this week. And these are just the most interesting, or egregious, ones. None of these necessarily have to be malicious. How would I know? But there's plenty of information to be gleaned and tossed onto the pile of data. Once you understand what the bad actors want from you (your full name and DOB are biggies), you can see how fertile Facebook appeared from the beginning. It's not the danger here that I spend most of my time on, though. I think about it a lot, that danger, but I haven't found any solutions. Right now, I lean toward all of us practicing social media hygiene, trying to make this infrastructure of our modern life more reflective of how we'd like to behave in public. I don't have much confidence in our success, and I wonder what this all will look like in a few years, but that's where I'm at now. Maybe I'll dump the whole business. But I was having dinner a few years back with an older person (older than me, by about 20 years), and as I watched her tell a Facebook story and how it prompted her to take some IRL action, my brain screamed and I may have, too, a little bit. I got push-back and shut up, mostly because I couldn't define the problem. I just felt it. Now I can. Facebook is not truth. It's not real life, it's not journalism, it's not really, even, commentary. I mean, it might be all of those things, specifically, at a specific moment. Just not in general. It's the difference between watching a man walk across a street, and hearing him tell about it. In most cases it doesn't matter. If a traffic accident occurs, it matters a lot. His version will be different than mine, certainly, maybe in small ways, maybe not so small. The security camera in the 7-11 will be a better arbiter of truth. Aaack. It's so obvious it feels insulting to write about it. Russian bad guys posed as regular Americans, or journalists, or some sort of fiction, and spread propaganda online. Everyone knows this. You can't trust an avatar. Your best friend from high school, whom you haven't seen in 30 years, is probably the same as that woman on Facebook. Probably, sure. You have ways of ascertaining that, probably. I mean. Unless you clicked on this. But you see. Vigilance is important. Most of us are probably OK, but it doesn't hurt to be careful. I'm not. Look: I drive a car, an incredibly dangerous thing to do. When I refer to Facebook as infrastructure, this is what I mean. You can choose not to participate. You can choose not to drive, too. Public transportation and pedestrian power both statistically improve your risk profile. It's an inconvenient life, probably, but it can be done. But we won't ditch Facebook, not most of us, which is where the vigilance part comes in. I feel fairly safe on social media in general, but I make dumb mistakes. I've clicked on a bad link a friend sent me, because he's a smart guy and couldn't possibly be one of those who was lazy with common passwords, etc. I've done other things. I worry about this all the time and I've done them. So I have cause here. And figuring out the problem has never been all that hard. The solution is trickier, and I suspect it's because we're not addressing the roots here. It's just too easy to call others stooopid. Note: They are possibly kind of stupid. Doesn't matter. We are inundated with trees. They come at us too fast. No way we're seeing the forest. Not without a lot of work. You know what the big picture is telling me? What's the common link between the election of Donald Trump, the #metoo movement, the #neveragain movement? The teacher strikes? The marches, the organizing, the slates of new candidates for thankless elected positions? People want to be heard. People need to be heard. People read about others being heard, and want in. A friend who's never done social media has recently shown up on Twitter. I don't know why; I can suspect. Anyway, the other day he tagged me in a film thing, name four films that were important in your life, that sort of thing. It's harmless as far as I can judge (four films, four songs, four books; I'll always be able to come up with four, but they won't be the same ones, and I wouldn't use any of this to identify myself at any rate). I thought it was cute, this guy trying to participate in our world. I played along. But who wouldn't? If someone asked you for your favorite four of anything, wouldn't you be thrilled? To be able to talk about your life, your feelings, your important stuff? So if a stranger asks you to tell them about your favorite aunt or uncle, why wouldn't you write a paragraph about Aunt Thelma? I mean, what's the harm? It's not someone you know who's asking. It's an entity, even, usually, a radio station or a Facebook page with an innocuous name. But you want to share, because they asked. That's what I think, anyway. At the moment. I'm not sure if this is a basic human thing, amplified by the fact that we can all broadcast now, or something about life in this time and on this planet. I don't have any ideas about that. But I think this need to share is driving all of this, and the bad guys know it, and we need to be the good guys, and I'm not sure how we do that when they ask questions about grandma, whom we loved, and who is now gone, alas.